Script-style on side, 'Kate Bush' & 'Hounds of Love' centered, black. The cover has both: "Made in Japan" and "Printed in Holland" on it. Helvetica-style on side, 'Kate Bush' right, 'Hounds of Love' left, purple. 'Kate Bush' right, 'Hounds of Love' left, purple. Inner sleeve has the two alternate pictures, lyrics and credits on it. Dark white/black-grey label. Same as #1.8.3.2.1, except: The cover actually is there twice, the outer one wrapped around the inner one and not fully sticking to it. 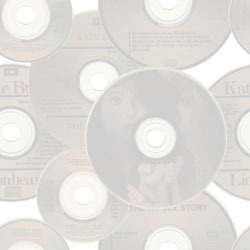 Same as #1.8.3.2.1, except: Includes original UK Hounds of Love merchandising insert/order form. 'Kate Bush' right, 'Hounds of Love' left, purple. Inner sleeve has the two alternate pictures, lyrics and credits on it. Same as #1.8.3.3.1, except: gold promo stamp on top right corner. Same as #1.8.3.3.1, except: grey marbled vinyl with a touch of pink. Same as #1.8.3.3.3, except: With purple rectangular sticker "SPECIAL MARBELIZED / LIMITED EDITION / features the hit single RUNNING UP THAT HILL". Same as #1.8.3.3.4, except: purple ribbon folder, including photos & biography.